As you will have seen, one side of the Brandenburg Gate faces ´Pariser Platz` which literally means ´Square of Paris`. And it does not carry this name for nothing. In 1814 it received the title to honour the conquest of Paris by Prussian troops fighting in the Wars of Liberation. Before the Second World War, ´Pariser Square` was the biggest square in Berlin. It was the site of the US and French Embassies, one of the city’s most renowned hotels, the Adlon, whose guests included Albert Einstein and Greta Garbo, the Academy of the Arts and various other properties and offices. However, as happened in the rest of the city, bombing during the war left all these buildings in ruins. 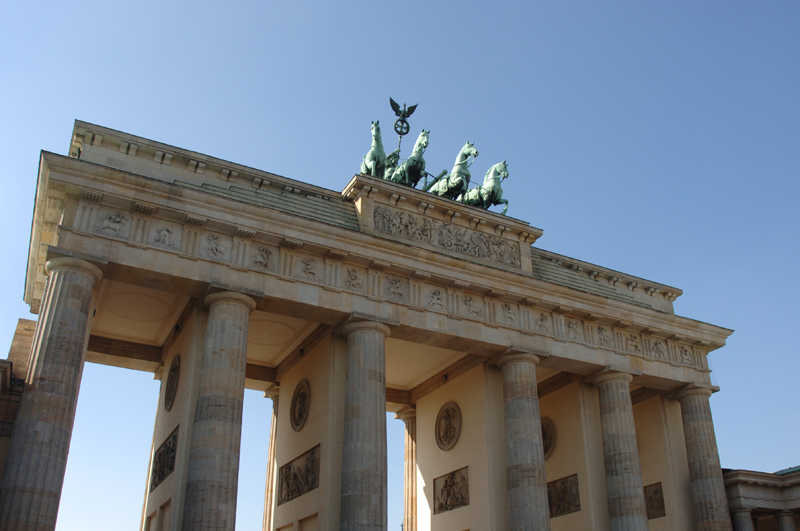 The only structure that remained standing after the attacks was the Brandenburg Gate. With reunification, the city’s government decided to rebuild the square: a new majestic hotel was built which opened in 1997, almost ninety years after the original, and it still retains the splendour and deserved prestige of before. What’s more, it continues to be the preferred place to stay for the rich and famous from around the world. You are sure to remember Michael Jackson dangling his baby from the windows of this very building. You can also find here one of the Academy of the Arts’ buildings which are located throughout the city. This attractive glass building is given over to archives and offices, however it also hosts magnificent temporary exhibitions. In addition, new buildings house the embassies of the United States, France and Great Britain. Another interesting building located in the square is that of DG Bank. It was designed by architect Frank O. Gehry and is situated between the Academy of the Arts and the US embassy. Do not be put off by its sombre exterior and be sure to have a look inside. Gardens have also been planted that copy the design of those from the year 1880. The square’s streetlamps are even replicas of the 1880 originals. Very prestigious architects have been involved in the remodelling of the zone and the results are truly spectacular. What’s more, it is a lively square full of locals as well as tourists, and is also a popular site for events and protests.